WHEN THE STREETS of your city fall into disrepair, who is responsible for them? And can locals do anything about it? A group of people in Waterford city answered that question last year when, led by primary school teacher Edel Tobin, they launched Waterford Walls: a street art festival that brought 25 artists from around world to Waterford to stencil, spray, draw, and paint on 25 unused walls and buildings. This year the festival is expanding, and from 25 -28 August, 40 artists will descend on Waterford to work on 40 walls spread across the entire landscape of the city, not just a designated area. “There are international mural festivals everywhere, all over the world,” says Edel. But what makes us stand out from everybody else is basically the buy-in of the whole city. If you look at any of the other ones, Art Basel, Montreal, Poland… they’ve just been given one area that is obviously due for demolition… Nowhere else in the world does a street art festival get this kind of access to an entire city. Such access is not surprising when one considers the hollowing out that has taken place in Waterford City centre over the last few decades. Suburban development policies drove large private housing estates, each constructed with their own shops, pubs and pharmacies, further and further out towards the coast. Wide roads connecting the suburbs directly to national motorways soon followed, each lined with cheaply built, aesthetically unimaginative, but easily accessible box stores: Tesco, Harvey Norman, Woodies DIY, PC World. The population, and thus daily life, was slowly sucked from the city centre. The extent of this trend was not fully revealed until the years following the recession of 2008. An over-reliance on a few major industries left Waterford over-exposed to the crash. Call centres found cheaper labour elsewhere, construction dried up, factories ground to a halt, and Waterford was left with one of the highest youth unemployment and emigration rates in the country. Waterford City became a kind of ghost town: quiet streets haunted by physically present but spiritually empty buildings. Vacant factory sites, boarded up shops and unused office blocks – the most visible signs of a city’s declining fortunes – were common sights. Waterford appeared unworthy, and became, in parts, uncared for, and seemed unwelcoming. Without ever choosing to, people in Waterford turned away from the town centre, pushed away by a convergence of forces. Waterford Walls is reversing this trend: it’s pulling people back in. On the surface, the festival is bringing brightness, colour, and beauty to an old industrial town. Warm blues, bright greens, deep yellows, and brilliant reds fill huge faces, shapes, and patterns across a city skyline formerly dominated by dull greys and browns. But it offers more than a face-lift: it is re-energising, re-imagining and re-claiming the shared public space of Waterford City. It is giving people who have spent so long looking outward – to Dublin, Cork, Galway, London, Australia – a reason to look inward again. Edel first made the realisation that we can and should be active in shaping our shared environment in 2014 with the Newstreet Garden project, a prequel of sorts to Waterford Walls. One day I was walking through Ballybricken, and I thought, ‘What a pretty little green…what a pretty little bandstand’…and then looking at the history, how the place used to be mobbed with people. And I was just like, ‘Oh my goodness, how could we just do something small?’. Gathering the support of over 700 volunteers, she decided to transform a nearby site of rubble and concrete into a lush, leafy urban garden. The site had been bought as part of plans to construct a huge shopping centre, but when the crash came the site was left in ruins, plainly visible to anyone strolling through the city. Now, instead, it’s a welcoming space for pop-up events in music, art, theatre, food and film. The success of this urban renewal project “created a sense of mutual trust between myself and the local council, which opened them up to the quite fantastical and progressive idea of handing the entire city over to a group of artists,” says Edel. Irish and international artists, such as DanLeo, Joe Caslin, Rask, DMC, Le Bas, Louis Masai are all returning for their second year. The large number of vacant buildings explains this, in part, but also a profoundly welcoming and open atmosphere. “We were instantly greeted with so much love, it was a fantastic first impression. I’ve been back loads of times since,” says DMC, whose work for Waterford Walls includes a quiet, sad female looking down the quay. An old, boarded-up, De La Salle community centre, directly opposite a De La Salle primary school, lies empty. Today, a mural of intricate, swirling patterns by Irish artist Eoin communicates a sense of movement and dynamism. 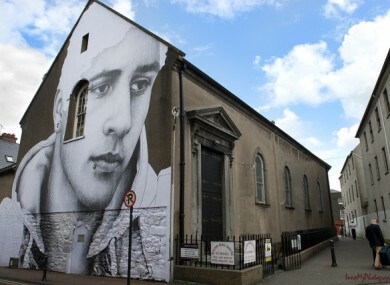 The art of Waterford Walls is re-engaging the people of Waterford with their physical place, and with each other. An art trail on the festival weekend allows people to wander through streets often left unvisited, and observe artists as they work from ladders and scaffolding. It is not long ago that street art was hardly considered art at all, more like vandalism: the illegal defacement of private or state-owned property. Thankfully, this is no longer the case. Place-marking has always been a fundamental form of human expression. From pre-historic cave-drawings, to Egyptian hieroglyphics, to frescos in ancient Rome, people have always made a place their own by making their mark. For too long this tradition has been dominated by a visual culture of commercial interests and private ownership. “The visual landscape of cities is full of forced advertising; we don’t ask for it to be there at all” says DanLeo, a Kilkenny-based artist, renowned for painting large, flat, colourful, animals, with geometric shapes and soulful eyes. When it comes down to it, the places are ours, so why shouldn’t we get to do nice art for people to see? Ultimately, it’s a layer of paint, not a permanent fixture, so why not have some fun with it? Rather than trying to make us feel bad so we will buy some product to feel better, the art of Waterford Walls treats us like human beings. Over the last number of years Waterford City has been going through an identity crisis. The two pillars on which it built its name – as Ireland’s oldest and busiest port town, Port Láirge, and as home to world-renowned crystal maker, Waterford Crystal – have each been reduced to peripheral supports. Attempts are being made, with some success, to rebuild the image of the city around The Viking triangle, a tourist trail which includes Reginald’s Tower, Christ Church Cathedral (the site of the marriage of Aoife and Strongbow), Blackfriars Church and a new, smaller, artisan Waterford Crystal trail. But what makes Waterford Walls so valuable to the city is its attempt to create an identity in the here and now, without looking back into the distant past. One often hears of Waterford Walls that it is transforming the city into a canvas. The metaphor is fitting: a canvas symbolises a space of pure potential, a space defined not by what it is, but what it could be. And this is what Waterford is becoming: a place defined not only by its past, but by what it could be. Email “Waterford locals have started a movement to reclaim their city's streets”. Feedback on “Waterford locals have started a movement to reclaim their city's streets”.